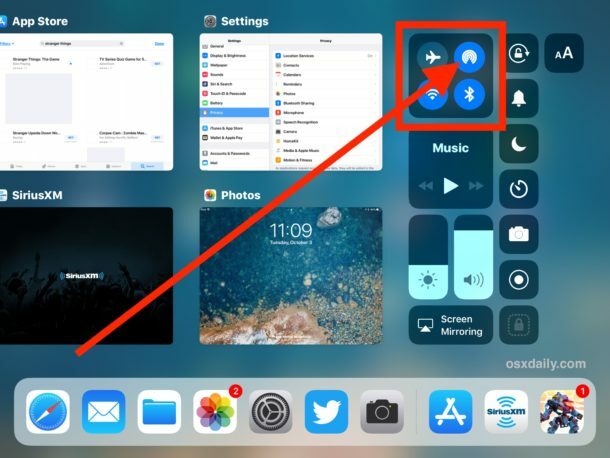 Where is AirDrop in Control Center on iPhone or iPad with iOS 11? Because AirDrop is hidden behind other networking options on iPhone and LTE iPad models, some users think the feature has been removed. It has not, AirDrop is in Control Center, just tucked behind other settings. Note that, as shown in the screenshot shown in step 4, the expanded networking control panel also reveals a new Personal Hotspot button that was never present in control center before ios 11. Personal hotspot allows to share the internet connection of an iphone or cellular ipad by turning it into a portable wifi hotspot for other wifi compatible devices to connect to. Not everyone knows what is “usual”! I swiped 6 or 8 different ways before finally finding the Control Center. AirDrop is in Control Center, hidden behind another section which has no suggestion it is there. The, how do you get to Control Center at all? Well now you have to swipe up to get to Control Center on all iPhone and iPad models, except for iPhone X, where you swipe down but only from the top right. Lack of consistency and obviousness to access key features is bizarre in iOS. UI is how it works… someone seems to have forgotten that lesson from the great Steve Jobs. I am unable to tap on the AirDrop icon to change/highlight it. Do I need to do something else to enable AirDrop on my iPhone 7S? Nothing shows up in preferences. You need to tap and hold (or 3D touch on iphone 6s or later) on the networking section to reveal the airdrop button. The networking section is the section containing the ✈️ airplane mode, cellular data, wifi and bluetooth buttons. You may also want to go to settings>general>airdrop and check there if it is enabled. 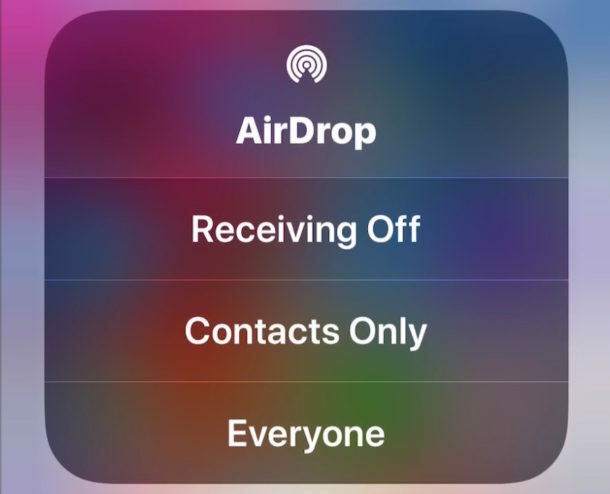 Also note that airdrop isn’t a on/off or connect/disconnect switch like the others. Instead, it has three settings to choose from: ‘receiving off’, ‘contacts only’ or ‘everyone’. You should be seeing this options when you tap the airdrop button in the control center and also in settings>general>airdrop. Just choose tap on a setting other than ‘receiving off’ and the button should highlight in blue. Finally, if you have the restrictions feature turned on, check to make sure one of those restrictions is not disabling airdrop. Just go to settings>general>restrictions. I still haven’t received iOS 11 for my iPad. Updates keeps telling me I am updated. How can I get it?? Which model do you have? iOS 11 is available only for the first ipad air, the ipad mini 2 and all devices newer than those. So if you have anything older, iOS 10.3.3 is the last you’ll ever get. I arrived here because my Airdrop stopped working on every one of my devices about a week ago (pretty much the same time that my iMac received the High Sierra update). I use Airdrop daily. It is very convenient. I have been using it for over two years, without a single hiccup. It is crazy that I have four iOS devices, and my iMac, and not one of them can see each other right now. I used to see every device. I have looked around the internet, and I have not seen a solution, but I suppose this is not an issue affecting tons of people right now. So it looks like a tech support call is on the horizon! After trying for days to load High Sierra onto my Mac Pro 2012, I finally took out all the PCI cards and extra hard drives and SSD’s and unplugged everything except one hard drive with EL Capitain, the screen and a wired keyboard and mouse. In particular, I replaced the video card with an old ATI single slot RV 630 256Mb hoping that it was an EFI model that I heard was necessary for the Firmware to work. For good measure of simplification I replaced my 16GB memory sticks with 2GB ones. Installation worked perfectly, but was several hours long.